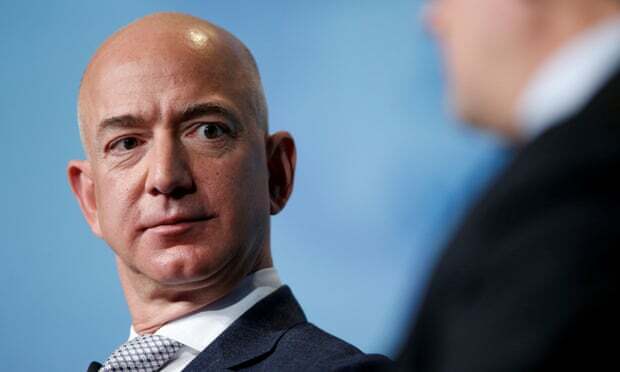 Jeff Bezos has accused the publisher of the National Enquirer of “extortion and blackmail” in a blogpost alleging it threatened to publish revealing personal photos unless the Amazon chief executive publicly affirmed the paper’s reporting was not politically motivated. Bezos, who is the world’s richest man and owns the Washington Post, became the subject of tabloid papers in January after he and his wife, MacKenzie, announced they were divorcing. Shortly after, the National Enquirer published “intimate text messages” revealing Bezos’s relationship with Lauren Sánchez, a former TV anchor. Bezos wrote in a Medium blogpost that he employed the private security consultant Gavin de Becker “to determine the motives for the many unusual actions taken by the Enquirer”, which is published by American Media Inc (AMI). Bezos said an “AMI leader” subsequently told him that David Pecker, the chief executive of AMI, was “apoplectic” about the private investigation. In the blogpost, titled “No thank you, Mr Pecker”, Bezos accused AMI of telling him “they had more of my text messages and photos that they would publish if we didn’t stop our investigation”.